Cole Dyer kicks his front leg up as the Rio Grande signee sets to turn on a pitch. 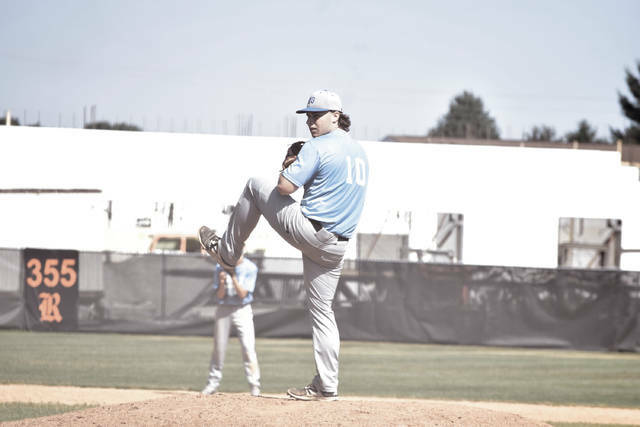 Jesse Jones threw five and two-thirds innings of one run baseball and produced a bases-clearing double in four trips en route to leading Post 23 to an 8-2 victory over the Diamond Prospects on Thursday morning in Raceland (Ky.). RACELAND, Ky. — Playing loose and with a purpose usually leads to a deadly combination that results in one simple word. On Thursday morning, the Portsmouth Post 23 baseball program carried over a strong effort on Wednesday evening into its Gene Bennett Baseball Classic Pool Play opener against the Diamond Prospects’ 15U program as Jesse Jones’ efforts on the mound (five and two-thirds innings pitched, three hits, three strikeouts, and one earned run) and at the plate (1-for-4, double, three RBI) led a Post 23 contingent that pounded out all seven of its hits over the initial four frames of action as Portsmouth claimed an 8-2 victory over their Lone Star State-based opponents at Raceland (Ky.) High School on Thursday morning. 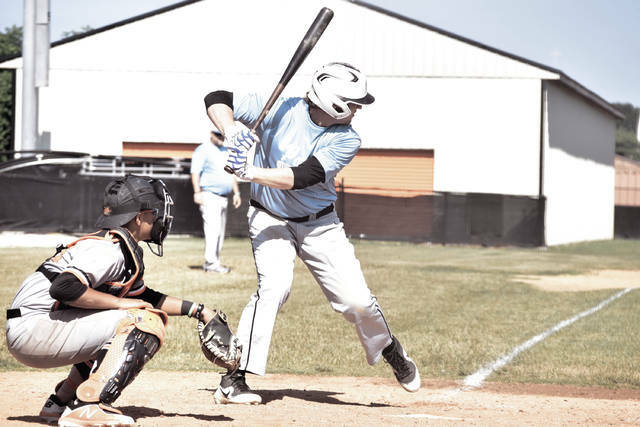 For Matt Miller, the contest was all about Portsmouth’s execution at the dish, and its ability to continue to turn on the pitches that were put into play. From the outset, the top of the Post 23 lineup proved to be rock solid against the Diamond Prospects as Miller’s club immediately kicked off play by producing when needed. After Tanner Kimbler started off the contest with a single back up the middle and Jake Ashkettle drew a walk, both runners advanced into scoring position with nobody out following a wild pitch. But when Jones and Cole Dyer were set down in order, it put Reid Shultz in a must-produce situation. True to form, however, the utility man from Minford stepped up large with a base hit to score Kimbler and put Post 23 in front after an inning of play. For much of the initial three frames, both lineups came and went in relative succession. That all changed in the top half of the fourth inning, when Brayden Davis, with two men gone in the fourth inning, drew a walk and advanced on a passed ball. Kimbler used a bloop single to the shallow part of left center field to score the sprinting left fielder, and from there, the Post 23 bats caught fire. After back-to-back walks by Ashkettle and Dyer to load the bases, Jones sent a rope out to the right center field gap, with the ball bouncing five times before glancing off of the wall in right center as Davis, Ashkettle, and Dyer all scored standing up on the bases-clearing double. A walk by Shultz then set the table for Lloyd (Ky.) Greenup County’s Kyle Gammon, who, in his first plate appearance with Post 23 after finishing his high school career with the Musketeers last weekend at the KHSAA State Baseball Tournament in Lexington, obtained a pinch-hit RBI single back up the middle to score Jones. By the time the inning came to a close, 10 players had batted around in an inning where Post 23 had accumulated all five of its runs with two outs on the board, which allowed Portsmouth to take a 6-0 advantage — with, again, all six runs coming via the two-out magic. For the remainder of the contest, Jones, along with Shultz, held the fort down for Portsmouth on the mound. Other than allowing an RBI double to Dylan Garcia — which scored Nathan Lewis — Jones didn’t allow another run to cross under his watch. When the junior talent ran into trouble in the fifth frame after giving up a walk and a double, Shultz entered for Jones and induced a flyout to right field to end the sixth frame unharmed. The latter didn’t give up a hit and allowed just one run — which was unearned — to cross on his watch as Post 23 cruised to the 8-2 victory.